Our charity is in possession of two great basketball offers. One allows two persons to watch LeBron and the Lakers from incredible seats - an opportunity that rarely comes along. The other allows two persons to pick one game from a list of available games for the Clippers. 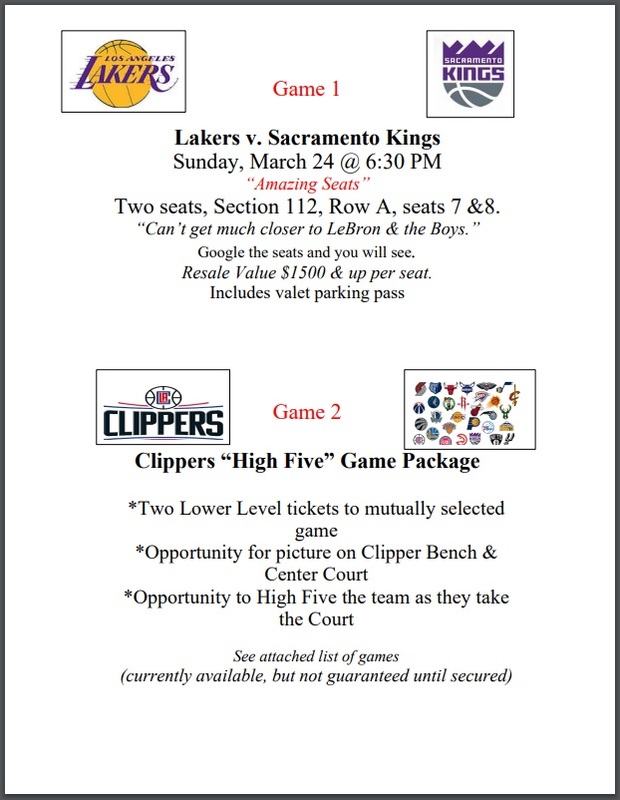 This package includes an opportunity to have pictures from the Clippers bench and Center court and to "high five" the players as they take the floor to start the game. We are soliciting monetary donations for either or both of these games. Of course we reserve the right to accept the highest bids or retract the offer should it become necessary. If interested, please contact me with details of your bid. DEADLINE TO SUBMIT OFFERS IS DECEMBER 1ST!